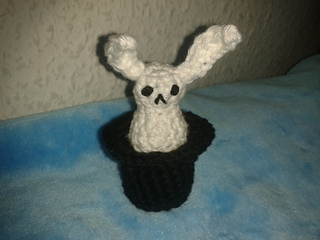 This is a pattern for the accessories of a classic magic trick: Craft a little (white) rabbit and make it magically appear inside its very own (black) top-hat! This pattern only requires the knowledge of basic crochet stitches (pattern uses US names for stitches) and very little left-over yarn. It is quick to make and simple. 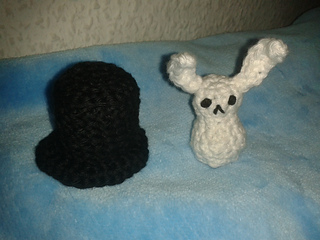 With hook and yarn as above, this pattern gives a roughly 3.5 cm tall rabbit and a top hat with an outside diameter of 3 cm.